No tire kickers, no low-ballers, they know what they have. 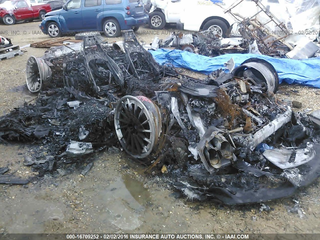 What you’re seeing here is (was) a 2015 Lamborghini Huracan that reached the natural end of its life cycle, and exploded. As such cars are wont to do. As this IAAI listing notes, the Huracan is currently for sale in Baton Rouge, Louisiana, and has amenities such as a 5.2-liter V10, airbags, an automatic gearbox, and a tilt steering wheel. All in all, this is the perfect project car for a highly ambitious wrencher with an unlimited budget, an infinite amount of time on their hands, and zero accountability to anyone. Check out the wheels, too! Nice.